Founded in June of 2006, WiredTree was started to provide cutting edge VPS and managed dedicated hosting. Their goal is to provide a superior managed hosting environment for their customers through a unique services suite, the latest advances in servers, customer service, and innovative network design. To do this, they developed a structure of internal support to ensure fast incident resolution and to handle client issues better. WiredTree designed a network that utilized to logically-separated networks: a private internal network and a public internet network. This allows them to provide services not provided by other VPS/managed dedicated hosts, such as server performance metrics and advanced service monitoring. They also use a centralized data center in Chicago and high performance and reliable bandwidth providers to improve public network performance. To meet the needs of the hosting industry, WiredTree uses the latest advances in server-grade technology. This hardware includes fully buffered memory, IPMI 2.0, the latest dual-core processors, 1000 Mbps Ethernet, SA-SCSI, and SATA II among others. These are combined to offer a variety of VPS and managed dedicated hosting services. 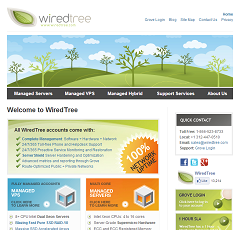 All WiredTree accounts utilize Grove Client Portal. This allows clients to review performance metrics like memory usage and CPU, monitor server health, access the knowledgebase and support system, perofrm instant reboots, and monitor bandwidth usage. Grove also allows users to gain network control for cracking down on spammers. ServerShield is also included as part of all accounts. It is an exclusive feature of WiredTree plans that was developed to enhance server performance, harden server security, improve system computability, and prevent spam. ServerShield includes brute force attack and advanced firewall protections. This also includes protections against HTTP intrusion and denial of service though Apache module installation and configuration. Below we will explore the specific features of each of the server hosting services and plans more closes. WiredTree managed dedicated servers run the latest version of CentOS Enterprise Linux 6 x86_64 with cPanel/WHM server control panel. Plus, all the servers provide full root access. The servers are connected to the “network-within-a-network” which includes 10, 100, or 1000 Mbps connections (as chosen by the client plan) to the private and public networks. For additional security, all client servers are separated into private VLANs. Each of the plans includes proactive security updates. There are also SSD standard and RAID available protecting the data. Other benefits include unmetered private bandwidth, 20 TB route-optimized bandwidth, four IPs with private VLAN, SuperMicro hardware with IPMI, and DDR3 memory. There are three managed dedicated server plans that vary based on type of microprocessor and number of cores. The Intel Core i3 plan is the least expensive at $149 per month and only has two cores. 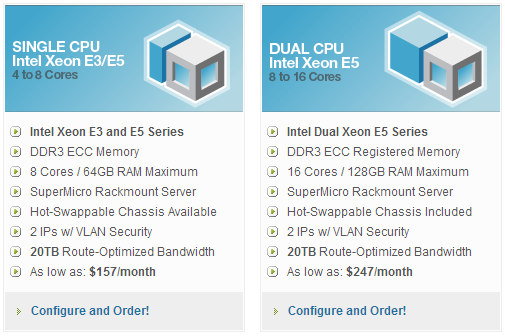 The Intel Xeon E3 and E5 series plan costs $157 per month and has four to eight cores. And, the premium plan has Dual Xeon E5 microprocessors and eight to sixteen cores for a cost of $247 per month. WiredTree’s VPS accounts run the latest release of CentOS Linux 6 x64. They also include a cPanel/WHM control panel and full root access. The number of accounts WiredTree allows is strictly limited to assure VPS resources are not overbooked and are highly responsive. Each of the servers are hand-built in-house using high-quality components. All VPS nodes use dual hexa-core or quad-core Intel Xeon CPUs including the latest Sandy Bridge-EP processors. The reliability and performance are boosted by Supermicro motherboards and chassis and ECC registered memory. WiredTree updates their plan specifications regularly with added memory, bandwidth, and disk space. They do this free of charge to those who are already on the plan. They also make it easy to switch VPS and hybrid plans with no downtimes and no added charges. Companies can even keep their IP addresses. There are two types of VPS plans. The Pure SSD VPS plans focus on more on performance than on disk space. There are three plans ranging in price from $55 to $85 per month. The plans increase incrementally in guaranteed RAM, CPU priority, bandwidth, and SSD Space. The upper end plan has 4,096 MB RAM, 6,000 GB bandwidth, and 80 GB SSD space. The other type of VPS plan is the Managed VPS SSD-Accelerated. These plans focus more on disk space, although they are also fairly high performance. There are three plans that range in price from $49 per month to $89 per month. The plans range in guaranteed RAM, disk space, and bandwidth. The top end VPS2500 has 2,560 MB of RAM, 150 GB of disk space, and 6,000 GB bandwidth. What makes WiredTree unique is their offering of a hybrid plan that combines the benefits of both VPS and dedicated systems. WiredTree describes it as being a very powerful and large VPS account with guaranteed CPU cores, higher disk space and memory allowances, and faster I/O performance. Hybrid accounts run the latest version of CentOS Linux 6, use a cPanel/WHM control panel, and allow full root access. There are two types of hybrid servers offered by WiredTree: SSD-accelerated HDD-based RAID-10 and “Pure SSD” consisting of just SSD RAID-10 storage for high performance. Each of these types has different plans to fit the needs of its customers. The Pure SSD Hybrid plans all are built using dual 16-core AMD Opteron 6200 series CPUs, ECC registered memory, and Supermicro motherboards. Each of the servers feature eight Hot-Swap Enterprise SSDs in battery-packed RAID-10 using high-end LSI Logic MegaRAID controllers. The Pure SSD plans start at $109 per month with one core, 5 GB RAM, 80 GB RAID-10 disk space, and 10 TB premium transfer. There is piecemeal customizability for anything better than that. The SSD-Accelerated Hybrid servers are dual hexa-core and quad-core Intel Xeon CPUs, including the Xeon E5 2600 series. These also have Supermicro motherboards and chassis and ECC registered memory. The SSD-Accelerated Hybrid servers use Western Digital’s RAID-optimized SATA II disks in batter-backed RAID-10 configuration with Adaptec RAID cards. 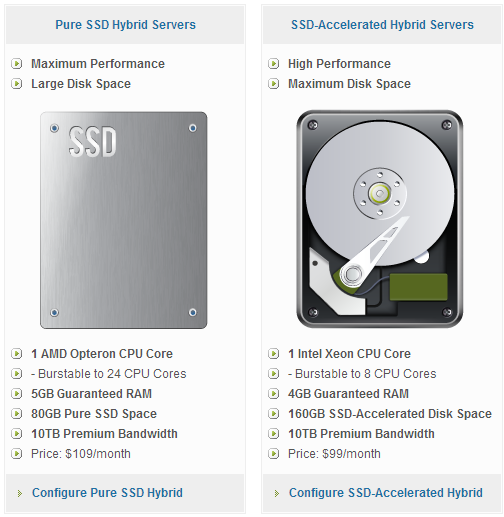 Like the Pure SSD Hybrid, there are customizable plans for the SSD-Accelerated Hybrid plans. The starter package runs at $99 per month and includes one core, 4,096 MB memory, 160 GB disk space, and 10 TB premium transfer. This is what I chose for this review. All the Hybrid and VPS plans have a la carte add-on options. These include bandwidth overage, WHMCS, LiteSpeed web server VPS over 2 GB, additional IPs, SSD-accelerated disk space, bandwidth upgrades, Fantastico, RV skin, Softaculous, pure SSD disk space, and guaranteed RAM. In my experience using the basic SSD-Accelerated Hybrid basic plan, I did not have any issues. I tested out the customer service lines and received all the help I needed. I have heard of others calling and finding out that the WiredTree engineers were already working on the specific problem with their server. I did some research combing the web hosting sites, and the only comment that was close to negative was a reference to WiredTree’s network being attacked a couple years ago causing some of their sites to go down. They fixed it immediately and have since taken precautions to stop future attacks. 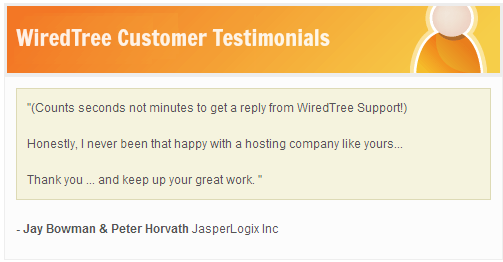 Last but not least by any means is WiredTree’s bread and butter: their support services. Their goal is to provide complete management of your servers, so you can focus on running your business. For software management, WiredTree provides phone and help desk support at all times: 24/7/365. They do this for all software installed on your managed server and for a variety of other hosting software packages. They also provide proactive security updates. WiredTree also monitors all servers at all times, and they respond quickly in the unlikely event of any downed services. They keep replacement parts on-site as part of their guarantee to replace any component failures within one hour. They also guarantee 100% uptime. As part of that guarantee, they will refund 5% of a client’s monthly service fee for every 30 minutes of downtime. I had no trouble getting set up with WiredTree. I’d expect some trouble getting my system configured to see what was going on with my server, but there were no issues. I called customer service just for the heck of it to see how knowledgeable they were at three in the morning, and they were incredibly helpful. WiredTree is the real deal. But, don’t take my word for it: they have a list of high-end clients as long as my arm. I highly recommend WiredTree for any company’s server hosting needs. They have plans to fit the needs of most any company that requires more than minimal firepower.